Roger will play his first match on Wednesday 9th of August during the day (according to reports he asked not to play on the 8th, perhaps he didn't want a cake on court 🙂 ) and his first opponent will either be Pospisil or Polansky. Both guys have some hard court matches under their belts post-Wimbledon, with Polansky making a Challenger final in Granby and Pospisil playing in Atlanta and Washington but only managing 1 win. Polansky leads the H2H 1-0 but that's from 2011 and I'd give Pospisil the favourite tag heading into that one. Roger actually played Pospisil the last time he was in Montreal and it was a fairly tough match, in fact, all three of their encounters have been quite tight matches but Roger's won all of them and you'd back him to make it 4-0 in the H2H should they meet on Wednesday. Round 3 is projected to be Jack Sock who scored a decent win against Raonic in Washington yesterday to make the Semi Finals. Ferrer and Edmund are in that section too with both of them capable of beating Sock if he's not having a great day. As for who Roger faces then it should be a comfortable match, Sock has quite a few holes in his game which Federer readily exploits, Ferrer has been running on empty all season although he's picked up a touch in recent weeks and Edmund has a huge forehand but is not the all round package. Despite that maybe Edmund is the more dangerous of the three as he can hit through the court. Into the Quarters and Nishikori is the seeded opponent. Like Sock he's playing in the Citi Open Semi Finals today and looks to be in ok form. Nishikori's always a bit of enigma though so I have no idea if he makes it to the Quarters here. Steve Johnson, Gael Monfils and RBA are in that section too and all are capable of going deep at 1000 level. Should it be Kei then I like Fed's chances as he's got the better of him in their last few meetings. If Nishikori has one of those days where he's hitting the ball super clean then he's obviously difficult to stop but you always question if he can hold his serve enough times to beat the top guys consistently. As for the semi finals, Thiem is the top seed but he crashed early in Washington and his hard court game is less than stellar. Dimitrov and Berdych are the other names in there but they too recorded losses in Washington, to Medvedev and Kokkinakis respectively, so it's anyone's guess who comes through that section. Then the finals are projected to be against old foe Rafael Nadal who'll be the World Number One if he reaches the semi finals. He's landed a tough draw though with Coric, Del Potro, Isner, Raonic and Zverev all possible opponents before the final. With three big names missing in Djokovic, Wawrinka and Cilic then the draw is wide open. Top 10 player Andy Murray is also missing due to his hip injury so some of the guys on the periphery (or journeymen as Max Eisenbud would say) will surely be eyeing the title here. Roger is obviously the bookies favourite going in along with Nadal but the Rogers Cup has never been his best tournament and he's never won it when it's been played in Montreal so I'm not too sure what to expect. He's had losses to Roddick (03), Djokovic (07) and Tsonga (09, 11) in his four appearances at the Uniprix Stadium so not his best hunting ground. Then again neither was Miami and cruised to the title 😉 . Anyway, I think he'll make the last four based on the draw then it's all about his form at the business end of things. What do you guys think? Let me know in the comments. Nishikori is always a tricky opponent when he’s 100% healthy esp in hard court. But I want to see zverev and Fed in the finals…. Should be fine, maybe some rust but has been hitting on hard courts in Switzerland. I guess many others have already played some hard court tourneys so always a chance he’s caught cold. But going to be massively confident after Wimbledon. I want him to lose here but win Cincy and US yet find it hard to imagine he’ll lose to anyone in his path! I wanted him to lose Wimbledon but win 1 match at the Laver Cup. I wanted him to lose in the quarters at Wimbledon and win the qualies in Montreal but and then go on to win the semis in Cincinnati but then lose the final and then win the 4th round in NY. After that it’s all icing. Been waiting on this post, Allez Roger! This is why I love this blog.. I meant Top 10 Male Player as well. My bad. I hope he gets to play well and the body is not too rusty. He need to get ready for the USO, even though another M1000 would be great as well. Think he’s got in a few practice sessions in Switzerland vs Fuscovics. See how he goes first match. Is Polansky in top 100? Pospisil is, so if they both are nothing to worry about. British Columbia continues to burn. The Vancouver area is thick with smoke from fires miles away and no rain in sight. Much worse than Beijing. I think Nadal has a much tougher draw but at the end of the day that never seems to matter. Maybe Shapovalov will take him out. Peter Polansky has an interesting history. In 2006 he fell 3 stories while sleepwalking in Mexico. He was lucky to live and not lose his leg. I watched Pospisil play and lose his 1st match in DC. What was that…he should have won easily. Looked like such a bad effort. So exciting to have Roger back in action. I still hope they make a fuss for his birthday! Guess Pospisil will crank up the effort in front of his home crowd. Maybe Polansky can do the same and get the win. Lucky you Miss Elly. Would love to hear about your first hand experience! I feel this version of Federer is not just an upgrade but a complete redesign where we cannot compare/predict his performance based on previous years.. just saying.. I don’t think complete redesign is accurate at all. He’s just playing good attacking tennis like he’s always done and the results are going his way. Another quiz while we wait for the maestro. Pfff. Disappointed in you, J. Only 58 %. And I thought you were knowledgeable about tennis. So strange to see Nadal and Fed top seeds again. Happy for Kohli. Yeah good title for Kohli, although he withdrew in Hamburg vs. Mayer with no injury other than tight quad? Weird withdrawal for a home tournament. Will have been a betting under dog in his Kitzbuhel opener, wins and then takes down the tournament. ha Top 10 player, I didn’t even notice that until looking at the comments. Well with Djokovic and Wawrinka out this puts more pressure on Federer as he’s the clear favourite along with Nadal for the US Open. I am very surprised he’s playing Montreal since the courts are slower. But, maybe this is his plan to get more used to New York as opposed to the proper fast courts in Cinncy. If he has a deep run in Montreal I guess he plans to skip Cincinnati . Or, his team has agreed that going for No.1 is worth it so he wants to pile up points. How do we know the courts are slow in Montreal? Last year the court in Toronto was quicker than Cincinnati… Federer also said that last time he played Toronto I believe. Yeah and both outside the top 100 😀 although Donskoy was second round, he beat Paire in Dubai. I have always thought that the courts in Toronto looked quicker than those in Montreal. Do you think Federer will continue to play day matches for the following games (3rd and quarters) – Or do they switch it up? Does Nadal get the night matches by default now? Dunno tbh, depends on requests I guess and what is making sense for fans / TV. Just looking forward to watching him play. I’d love him to win it but no expectations here, let’s just see what happens. If he comes out clean with not much rust I fancy his chances at beating anyone. Decent draw, let’s see how deep he can go. Heard he requested to play on Wed, probably wants to celebrate his birthday with family. Back to back tourney is going to be a bit tough but he should have enuff in his tank. Yeah he did ask for Weds match. Hopefully not a fuss made for his birthday. I hope Fed doesn’t have to meet anyone outside the top 100. Not sure about Polansky’s rank. Fed might want to win his first title as a 36 year old as soon as possible. Hope it is against Nadal next Sunday. Good draw. He can win this. How do these courts play? The only thing I remember about Montreal is Roger destroying his racquet playing against Djokovic. Or was it someplace else? I thought that was Miami? You all packed and ready to go ? I’ll find some courage and do it. Forget about the work. We’re talking Roger here. Toronto was quicker than Cincy last year. But no idea on Montreal. Ain’t fast. But ain’t a slow hard court either. Somewhere around the middle. IDK really. Maybe something like Miami??? As a Canadian I have been watching Polansky and Pospisil. Both guys needed WCs to get into the tourney. On a good day Vasek can be a threat but he is so wildly inconsistent I don’t think Fed will have a problem. Peter Polansky actually had good results in 3 Challengers in a row, all in Canada. So maybe having a home crowd does help him. On Monday he will be at a career high of around 115. He is a classic baseliner, and I expect he would be even less of a problem for Roger than Vasek. I enjoy Pospisil. He has a lot of talent and is a good athlete. Good serve, fh, net play BUT he screws up at the big moments. Drives one to drink. Nice to see more and more focus on tennis here. Hartt, didn’t know you were Canadian, eh. Reminds me of Berdych in his build. Not a great mover. Berdych seems stockier to me. Hey, we are still in Zurich weather wise. A new ploy not to jinx Canadian Open? Ok so I am in Montreal. Which day/session do I buy tickets for ? I ideally want to see as good a match as possible of Roger’s but if he is not playing I certainly don’t want to watch. Really tricky situation here. I am ok with spending the money as long as I can watch a good match of Federer’s. After that who knows, you’d likely have to buy day / night to cover both bases? Either that or wait till schedule comes out and buy off a reseller site? No idea if 1 x ticket from a reseller site is more than buying day & night though. I’ve not looked into ticketing so can’t really advise on how easy it is to buy on the gate etc. Thank you for our knowing about Zürich, all Swiss conditions are interesting. Any more comments about the court/balls condition in Montreal? I didn’t follow any games yet, so have no idea. And – HAPPY BIRTHDAY, HAPPY AUGUST, HAPPY REST OF 2017, HAPPY ALL YEARS YO COME! Today is Roger Federer’s birthday. It is also my dad’s birthday. Let’s have a toast to a great 36, and I’ll just quietly keep repeating that in a parallel universe Roger is my dad. A very happy birthday to your Dad! Two of the greatest people you can look up do, born on the same day. You’re a lucky man! Indeed, Sid 😀 !! Hope you have a good day too! Fun fact: my birthday is the 23rd of July, which is also Roger’s daughters’ birthday! That parallel universe thing looks better and better. Happy Birthday, Roger! My birthday on Sunday…will I see him holding the trophy, that’d be a nice gift. Happy 36 and let’s all hope that he can play as long as he can! 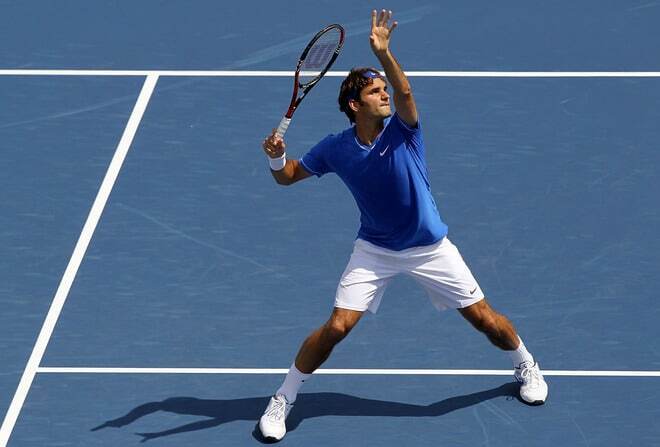 We also hope that RF will remain healthy for the present and the future. Today is my name day (my first name is the same day as Roger’s birthday)… hi hi ! Happy birthday ! Tignor picked Fed to win the USO. Well, I guess it had to end at some point.